LOVINGTON, N.M. – A walk around the Lea County Fairgrounds in early August reveals many sights, sounds and smells. 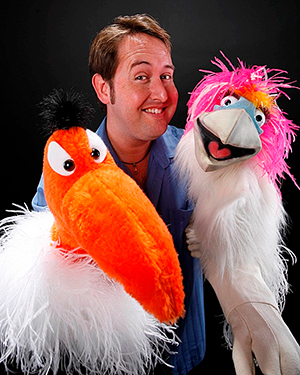 Ventriloquist Kevin Johnson returns to Lovington this year to be part of the daily fun at the Lea County Fair and Rodeo. It’s robust and inspiring, and the sounds of fair-goers resonates across the complex on Lovington’s eastern edge. There are tasty treats and delicious meals; there are games and rides; and there are great acts that make up the daily entertainment schedule. The Lea County Fair and Rodeo will feature daily entertainers from 5 p.m. to closing every night of the fair, from Aug. 1-9. This year’s lineup includes ventriloquist Kevin Johnson, the Equilibrium Circus and the Ham Bone Express Pig Races. “We talk to people in the community about what they want to see at the fair, and we try to stay with that,” said Corey Helton, chairman of the Lea County Fair Board. Ham Bone Express is operated by the Borger family, and they bring their action and comedy show to Lovington from northwest Arkansas. It’s funny, fun to watch and fast-paced, and the Borgers claim to have “The Swiftest Swine Off the Line.” It has four races with four pigs in each race, and the master of ceremonies keeps the crowd involved by assigning cheering sections, with each section having a designated “rooter,” or cheerleader. The tandem presents the ancient circus art of hand-to-hand with quirky twists as they perform a number of tricks and stunts that may not be seen anywhere else. They also add a little heat to the equation in the form of fire. The Equilibrium Circus features the award-winning duo, who show off their athletic talent and creativity. With more than 30 years of combined experience, they have appeared in film, television, theater, street performance and live events. Johnson, who started ventriloquism at age 9, has a pretty good pedigree, too. He was self-taught, but he was drawn to entertaining quite naturally – his grandfather, Harley Noles, performed magic shows throughout Colorado and offered a spot in his lineup should Johnson develop his act well enough.